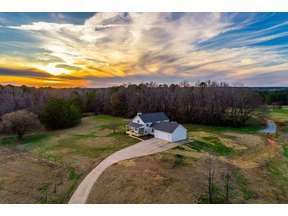 Fully remodeled farm house sitting atop Over 25 acres in sought after Morgan County. This property features fenced & cross fenced pastures w/ a covered run-under for all your horsey friends that could easily be converted to 2 stalls. Lots of space in this 3 bedroom/2 bath home. The open floor plan is highly sought after today w/ vaulted ceilings, new black stainless appliances, all new lighting, remodeled bathrooms with a rustic farmhouse touch. Owners suite has a large sitting room with a barn door.... or turn it into an additional closet. Flat bottom tub in the owners bath with a subway tile shower. Hardwood floors in the living area. Theater room in the basement w/ fireplace & snack bar with a beverage cooler. New roof & professional landscaping.